This year’s comedy lead acting races have been shaken up in a major way. Veep has taken the year off opening up the lead actress race for the first time in six years and there is a long line of overdue performances and one undeniable frontrunner who are vying for their first Emmy. Meanwhile the lead actor race has lost a couple of major names (and is tainted by one current nominee) who have been accused of sexual misconduct. Now the category is focused on younger, fresher names in comedy including last year’s winner Donald Glover and Bill Hader in his biggest television project since SNL. This year’s lead actor race is the exciting culmination of two well-liked actors, Bill Hader (Barry) and last year’s winner Donald Glover (Atlanta). This category is all the more interesting because the two artists are going head to head in an unprecedented five categories this year: lead actor in a comedy, guest actor in a comedy (both for hosting SNL), writing, directing, and outstanding comedy series. In such a close race last year’s winner, Donald Glover, has the slight edge. 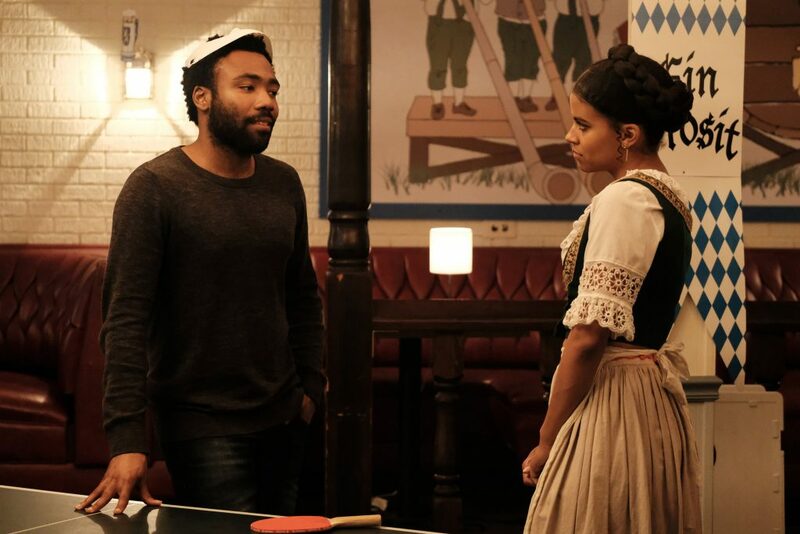 Atlanta is the best reviewed show of 2018, it’s a groundbreaking comedy that draws in attention with its cool factor, and Glover has quickly proven himself to be one of the defining voices of this generation. On top of Atlanta he has released the most talked about music videos of 2018 and was the only well-received element of Solo: A Star Wars Story, with fans begging for his own film. He also has the most talked about episode of any show this year with Teddy Perkins – a “white face” performance that shocked audiences in the best way possible. Bill Hader is an actor that is beloved by the television academy and long overdue for major recognition. After multiple nominations for his time on Saturday Night Live he is back on television fully showing off his creative strengths in front of and behind the camera. Working in his favor is the fact that Barry is not the direction we all expected Hader to go as a former Marine turned hit man trying to live a double life as an aspiring actor in the valley. In fact Hader seems like the obvious choice this year but the fact that Barry seems to be polarizing audiences might work against him. Both Hader and Glover are relatively young and it opens up a small possibility of a veteran performer pulling off an upset. The only other actor with any momentum this year seems to be Ted Danson for The Good Place. With sixteen career nominations Danson is an Emmy favorite. The Good Place also has an extremely loyal fan base that might have the power to push Danson towards the fourth Emmy of his career. The only question is whether or not there are enough fans of the afterlife comedy in the actual television academy. The other three nominees, although well-liked, don’t have the momentum to win this year. Larry David earned his 26th career nomination but the actors branch has never warmed up to comedians playing a fictionalized version of themselves (Louis CK for example). William H. Macy has won multiple SAG awards for his work on Shameless but that has never translated to an Emmy win and this year will be no different. Anthony Anderson could have been a potential spoiler but voters will probably avoid him this year after it was revealed that he is being investigated for serious sexual assault claims for the third time in his career. Rachel Brosnahan’s titular performance in The Marvelous Mrs. Maisel has somehow managed to breathe new life into an already crowded lead actress race after six years of Julia Louis-Dreyfuss dominating the category. She has already won a Golden Globe, Critics’Choice, and TCA Award for her first season and she is the closest thing to a lock heading into this year’s Emmys. Her performance has critics and audiences so excited that she probably is popular enough to go head to head with Louis-Dreyfus herself. There isn’t much left to say about her performance as a housewife turned comedian that hasn’t already been said especially here at ADTV. On top of the endless deserved praise she has received over the past year voters also are familiar with her Emmy nominated work in House of Cards so they know what she is capable of as an actress. Another factor making Rachel Brosnahan a near-certainty is that there isn’t a clear alternative. All five of the other nominees are popular enough in their own right and are likely to split the vote. Allison Janney is an Emmy favorite and has already won two supporting actress Emmys for her performance in Mom before moving to the lead actress race. Janney also just won the Oscar which might attract more votes. Still Emmy voters simply aren’t watching Mom as they continue to distance themselves from multi-cam sitcoms. Lily Tomlin is another entertainment icon that Emmy voters clearly love but after four consecutive nominations there is no reason to suggest this is the year that she would finally win for Grace & Frankie. Tracee Ellis Ross is an actress that has been working on television for nearly 20 years and is finally being recognized alongside a popular sitcom but she unfortunately wasn’t given enough material to stand out in the fourth season. Pamela Adlon was just nominated for the second time for Better Things and seventh career nomination. It would have been a really interesting actress race with voters rallying behind Adlon after her creative partner was exposed for sexual assault but enough voters don’t seem to be watching Better Things. One of the most welcome surprises this year was the inclusion of Issa Rae for the second season of Insecure. She is quickly becoming one of the most sought after creatives in Hollywood and she perfectly represents a segment of New Hollywood that is getting their start by creating online content and being discovered on social media. Unfortunately for Rae Insecure is a lot smaller in scale compared to the hour-long period comedy of The Marvelous Mrs. Maisel making it harder for her to stand out.